The Electronics TakeBack Coalition believes the electronics companies should take responsibility for their products throughout their life-cycle, providing “cradle to cradle” management which includes taking back and recycling their products. This concept of Producer Responsibility (sometimes called Extended Producer Responsibility) is usually achieved through legislation, although some companies do it voluntarily. 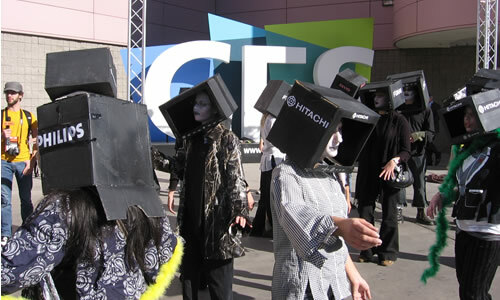 TV Zombies rose up from the landfills to visit the 2009 Consumer Electronics Show in Las Vegas, to urge their manufacturers to take them back. While we support legislation that requires electronics manufacturers and brand owners to take responsibility for their products, we also pressure the computer and television companies directly to establish strong takeback programs with responsible recycling, and to design cleaner products – ones that both use safer, less toxic materials, and which are designed to last longer, and to be easier and cheaper to recycle. In November 2007 we launched our Take Back My TV campaign, to encourage the TV companies to offer free takeback and recycling programs before the digital conversion deadline (June 12, 2009). Now, eight TV companies have voluntary takeback programs to recycle their old products. In October 2010, we published our most recent Electronics Company Reycling Report Card. There we graded the TV, computer, printer, and game console companies on their takeback programs. There are some companies in the lead, but we still have many companies earning Ds and Fs.